Photo frame miffy with little ducks 6x9cm sp./lacq. A side spoon is practical for feeding baby's and toddlers or for them to feed themselves. The spoon, which is also suitable for right-handed people, has an image of Miffy, and the bowl is engraved with three small carrots. This spoon is made of 18/10 stainless steel and is dishwasher safe. Can be engraved. 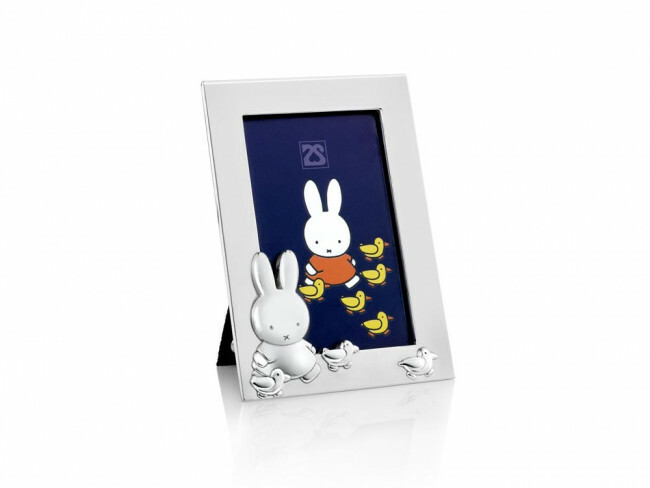 Photo frame with an image of Miffy and ducks on its border. Suitable for a single 6x9 cm photograph. The photo frame is silver-plated and lacquered, and therefore requires no polishing. You're reviewing: Photo frame miffy with little ducks 6x9cm sp./lacq.